This is a beautiful cover!! 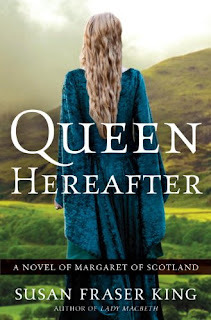 The story of Margaret, the Hungarian-born Saxon princess who married Malcolm Canmore, King of Scots, bringing reform and foreign ways to Scotland—Queen Hereafter is also a tale of Margaret’s friendship and rivalry with Eva, a Scottish harper, and Eva’s kinswoman, the former Queen Gruadh, known as Lady Macbeth. Susan Fraser King is also the author of Lady Macbeth: A Novel which has received many favorable reviews on Goodreads thus far, which was released in February of 2008. Have you read it?